Reader Special! Purchase anything from Kids Konserve from now until the end of Sept. 09 and save 15% using coupon code ecochic. If you read my post earlier about Waste-Free Lunches you will know that I have been working on making our own lunches more waste free. The best place to start is with the lunch box which is the easy step. 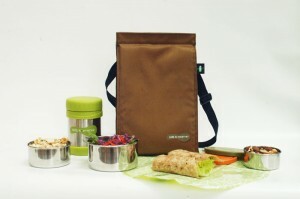 How about taking it one step further and purchase a complete waste-free lunch kit? Kids Konserve is a company right here in the USA that sells these cute lunch kits complete with lunch sack, cloth napkin, stainless steel beverage bottle, food cozy and 2 stainless steel food containers. The complete kits start at $40 or you can purchase each item individually. The signature lunch kits have a cotton sack while some of their newer lunch sacks are made from 100% recycled water bottles. My favorite item in each kit is the Food Cozy. These reusable, food-grade wraps are a good alternative to baggies and plastic wrap. They can be sealed with a strip of Velcro and can be hand-washed to be reused the next day. Food Cozies are on sale during their Back To School Special for 25% off. This year I am serving on the PTA and helping make my sons school a little more GREEN! While Waste-Free Lunches is on the agenda, it’s not our first priority. We are currently working to get recycling set up in the classrooms and offices. Once we get the recycling set up we can then promote Waste-Free Lunch days. Kids Konserve holds challenges for schools to help them promote going waste-free. One way to promote Waste-Free Lunches is through fundraising. Kids Konserve has a complete school fundraising package available online. Schools can earn 10% back for each purchase of Kids Konserve products. One thing that I hope to promote by the middle of the year is a Trash-Free Tuesday. You can find other ways to promote Waste-Free Lunches on the Kids Konserve website. What’s your favorite Kids Konserve product? I love the Kids Konserve Lunch Kit. The stainless steel containers look great!rnThanks for the coupon code! I love the Kids Konserve Lunch Kit. The stainless steel containers look great! this is a cute launch set for kids, im sure their appetite will increase if they will eat in this lunch pack. Very nice post. Information given is nicely elaborated. Thanks for sharing.